This is my entry in the May of the Dead Blog Carnival. True to form, it's also a crossover piece that gives a taste of the fantasy setting we're developing over at The Gamer Assembly. How can you possibly go wrong with undead symbiotic plants? Greetings and long life to Speaker Tobias and the rest of The Cabinet of the Confederacy of the Silver Charter. I trust this letter finds you in fair disposition. Per your request, I have assembled a team of Corps researchers to study the remains of the unknown attackers recovered from the trade cog Fair Winds. We have transferred the bodies to a mountaintop facility to better utilize what magical talents we have at our disposal. The remainder of this missive summarizes our findings, though we eagerly await your summons to discuss the situation in more depth at The Cabinet's convenience. The nature of the threat has been misrepresented. These attackers are not a new form of waterborne plant creature, at least not entirely. They look like animated humanoid bodies made of black seaweed, but we discovered two organisms in a symbiotic relationship when we started our examination: a sea devil wrapped in an almost-impenetrable casing of a strange seaweed. We found two things of note when separating the plant from its aquatic humanoid host. First, the sea devil displayed signs of decay prior to the damage caused by the seaweed's attachment. Since these creatures were encountered far out to sea, they were too far from a controlling lich to keep them animated, especially given the magic suppression effect of the open ocean. Some of our team concluded that these are the more powerful, ritually-created Draug Zombies that can operate far from their animators. This worries us since the components for the Draug ritual cost far more than all but the richest privately-operating Necromancer can afford, especially given the overwhelming numbers reported in later attacks. If these are Draug Zombies, then there must be a well-funded nation bankrolling these attacks. Second, the seaweed moved on its own even though we could detect no life. It seemed to seek out sources of necrotic energy, as it attached itself to a skeleton we had animated purely for experimental purposes. Immediately after the seaweed covered the skeleton, the combined creature broke free from our control and attacked us in an attempt to escape the room. We defeated the suddenly well-armored skeleton, but the seaweed appeared unharmed as it reached out for its next undead host. Cyril, whose sense of humor has obviously been affected by his time spent in the experimental chambers deep under Hallowdeep, took to calling the black seaweed "Deadweed". A more proper name will be assigned to this newly-discovered organism at a later date, but for now the common name of Deadweed will suffice. From our experiments, we found that Deadweed will only bond with an undead creature. It feeds off the necrotic energy that animates its host but provides many benefits. Deadweed seems to exerts its own will, which some of our team thinks would allow control to extend far from an undead creature's creator, much like a Draug Zombie. We have no way to definitively prove which is correct, and the debate still rages at the time of this writing, so I present you with both ideas. Neither idea brings anyone much comfort. I have sailed the Elven Sealanes in my youth, attaining the rank of Captain, and I have bent magic to my will after retiring to the land to study. Never before have I seen an intelligent necrotic plant like Deadweed. If an intelligence has created Deadweed to extend the reach of an undead army, then we must find and eliminate this threat at our earliest opportunity. Deadweed subverts the natural order of things and will strike against every living thing at will until we no longer have the strength to fight back. I now believe Ana-Lesh sent me her warning dream about this situation. I beseech you to treat this new threat with the utmost seriousness and quickly organize as many Corps teams as possible to find its origin before we allow this blight to spread any further. I am no longer a young elf, but I gladly volunteer to aid in this endeavor. When bonded with an unintelligent undead creature, Deadweed provides increased defenses (+2 to AC and saves, plus DR 5/piercing) and resistance to fire (fire resist 10) by feeding on the negative energy animating the undead creature (-10% hit points). 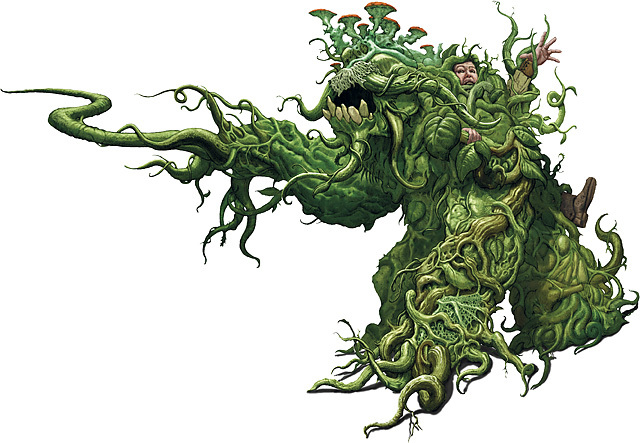 As an intelligent undead plant, Deadweed controls the undead creature, allowing its creator to give verbal commands (obeyed 75% of the time) while uncontrolled. This also makes the undead creature harder for anyone else to control, granting a +4 bonus on Will saves against Control Undead and similar effects. In D&D 3.5, this effect also gives a +4 level bonus against turn attempts. In Pathfinder, this effect grants a +4 bonus to Will saves against Channeled Energy and no damage on a successful save. Deadweed can inflate or deflate internal air sacs to move itself and its host creature vertically in the water and maintain any desired depth. Patches of Deadweed can be found floating in salt water, attracted by the residual necrotic energies given off by dead creatures at a shipwreck or battle site. A large patch can attach to a freshly-dead corpse and animate it as a free-willed zombie in 10 minutes. Any Deadweed-bonded undead creature that kills a creature smaller than itself will break off a piece of the Deadweed and animate the corpse as a free-willed zombie in two rounds. 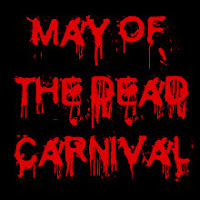 Check out the other entries in the May of the Dead Blog Carnival!